THE WRITING BUDDHA - Opinions | Books | Movies: Scarred For Life, Healed Forever by Ashwati Menon (Book Review-3*/5)!!! 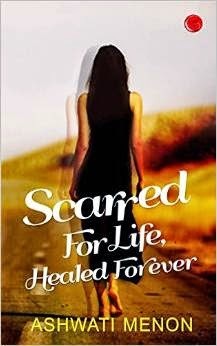 Scarred For Life, Healed Forever by Ashwati Menon (Book Review-3*/5)!!! Scarred For Life, Healed Forever" is the latest book I finished reading. It's written by the 2nd time author- Ashwati Menon. This 126-pages novel is written with an intention of making people aware of the kind of power our brain has. It uses concept of 6th sense and intuition to tell us about some power a normal human being can have. Ashwati Menon have written the book in a very easy language which I should compliment the first thing in this review, as writing on such topic could have become complicated and hard to understand for a layman like us. It was quite evident that the writer has gone through a good research before writing on such unusual topic. There could have been few parts where the story must have looked fake but luckily, the determination of author towards projecting this story in good light made it look possible and a story-next-door. Some scenes are written really very terrifically. You might get scared imagining the situation but that's true in some rare cases which we see in news channel sometimes. The characters are wonderfully projected by the authoress even when she wrote this in quite a short-story format. Nishtha is beautifully portrayed. Her brother, Prakash and Sahdev are another two good characters who shall be always remembered whenever this book would be a topic of discussion. I also liked the author's choice of keeping this story short as even 10 more pages could have made it boring and unacceptable as it's not about fun and humor but written on a very serious yet interesting topic. The only drawback which I feel will work against this book is its narrative. I found the flow of the story very confusing. Author switches from one time period to another without intimating and therefore, it leads to a messy situation in a reader's mind. The flashbacks could have been written more beautifully. In all, I would give this book 3 stars out of 5- a little above average attempt.